Within a year or two, the U.S. military could field a portable, laser backpack device that will provide a three-dimensional (3-D) map of buildings. The reconnoitering pack could be used by reconnaissance scouts to form a 3-D, interactive image of buildings that other troops might have to access at a later time. 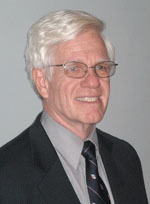 during training and missions. That trust is priceless in theater, but what about other environments? who has your back in cyberspace? The U.S. Marine Corps now has its first fully assembled Ground/Air Task Oriented Radar (G/ATOR) system and is working to overcome past difficulties to put the asset in warfighters' hands. Plans to upgrade multiple radar capabilities with the single system hit some snags over the past few years, but developers are back on track after finding solutions to the problems. While anecdotes abound about professionals who have lost job opportunities over something they’ve posted online, new research reveals that the risk is greater than suspected. A survey Cross-Tab conducted of more than 1,100 human resources professionals found that 70 percent of recruiters have rejected a candidate for employment based on text, photos or videos they discovered online. Trawling the Internet can be a dangerous activity, but the security status of different types of websites is not the same, Sorin Mustaca, data security expert, says. However, when more than 3,300 people responded to a survey about Internet security on the Avira GmbH website, more than a third of the respondents said when it comes to security, all websites are equally dangerous. Mustaca, who works for Avira, says in reality, some sites and computer activities are riskier than others, but Web devotees can take simple precautions to protect themselves from e-predators. The Global Threat Reduction Initiative (GTRI) is working to keep U.S. citizens safe from dirty bombs by conducting exercises on the other side of the world. Members representing the initiative recently wrapped up a three-scenario tabletop exercise in Mongolia to help the country prevent terrorists from obtaining its nuclear or radiological material. Give two cents—get big prizes. The U.S. General Services Administration (GSA), in partnership with ChallengePost, launched Challenge.gov on September 7 at the Gov 2.0 Summit 2010 in Washington, D.C. The free online challenge platform invites the general public to propose solutions to government challenges, including the U.S. Army’s push for new training and simulation tools utilizing artificial intelligence. The People’s Republic of China (PRC) is translating its dynamic economic growth into a long-term military program that projects power far beyond territorial or even regional defense. Intensive information operations may be buttressed by long-range ballistic missiles with warheads designed to evade missile defenses if China becomes involved in a large-scale conflict. And, a host of new technologies may upgrade traditional military systems to give the Asian nation a regionally destabilizing force. This summer I attended a series of thought-provoking conferences, ranging from business technology to clean energy to cybersecurity and network integration. Collectively, they suggest that we’re living in a “golden age” of technological innovation, but they also highlighted a growing gap between increasingly interactive capabilities and the ability to provide security at several levels, ranging from individual privacy to critical infrastructure protection. 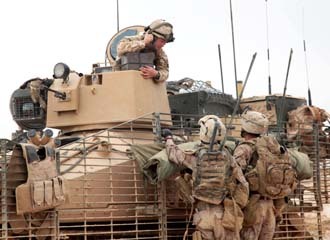 A British soldier in an armored vehicle talks with U.S. Marines while on patrol near Marjah in Helmand province in Afghanistan. The United Kingdom probably will have military forces in Afghanistan for the next five years under the aegis of the International Security Assistance Force. Pvt. Sherman Huff, USA (l), 207th Army Liaison team (ALT), helps Pfc. Aaron Garlington, USA (c), 206th ALT, and Spc. Shaun Marshall, USA, 207th ALT, inflate a balloon with helium. 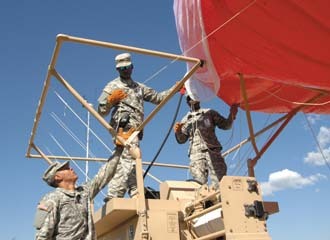 The aerostat provided surveillance at the U.S. Northern Command (NORTHCOM) site in Colorado Springs, Colorado, during Coalition Warrior Interoperability Demonstration (CWID) 2010.